“That looks really good,” he said slowly. He sighed. That phrase means that there is no way I am buying a chemical cocktail no matter how good it looks. It also means that, with my schedule, it could be weeks before the copycat item made it to the table. I decided to put it on the top of the list. Because I adore the man. What can I say? The cake is my rolled sponge recipe but I baked it just a little longer to keep the cake firm. 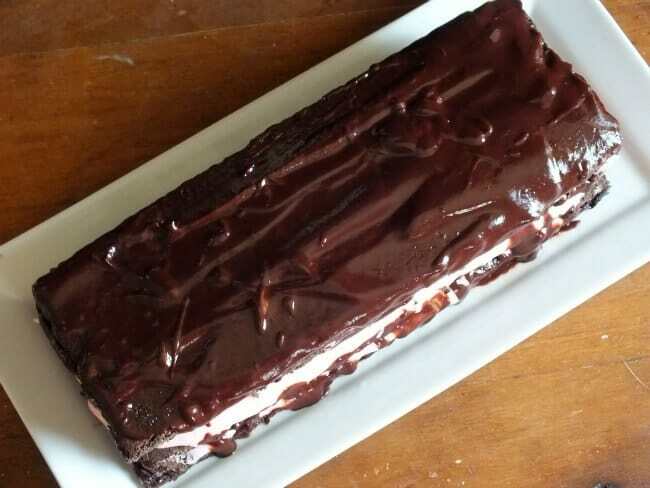 I baked the batter in a large jelly roll pan because it gives each layer a crust. If you bake it in a loaf pan and cut layers you’ll end up with one layer with a crust and the rest of the layers soft — too soft. Before you put it in the oven drop it onto the counter a couple of times to break up the air bubbles. Once the cake was baked I turned it out to cool and then cut it into even layers. For the best results you need to trim all of the edges about 1/2 inch in to get rid of any really hard parts. The buttercream is light and minty. I used pink coloring because I just think it looks better. You spread it as evenly as possible between the layers and then cover the top layer with a bittersweet chocolate buttercream. It is really important to chill this cake well before you plan to serve it or the filling will mush out when you cut through the cake. 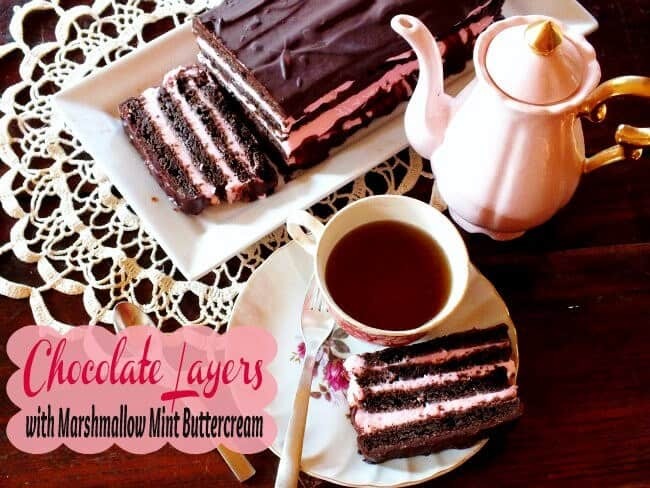 With the shiny chocolate topping and the blush pink filling this makes an especially great cake for a tea or Mother’s Day. IMPORTANT: HAVE ALL INGREDIENTS AT ROOM TEMP! Grease a 15 1/2 x 10" jelly roll pan then line with waxed paper and grease again. Beat the eggs in a stand mixer util they are foamy. Mix the flour, baking powder, and cocoa together. Fold it carefully into the egg mixture. Remove from oven and invert the pan on a piece of waxed paper. Remove the waxed paper on the bottom of the cake and let cool. Beat the butter and marshmallow cream together. Add the powdered sugar and flavoring. Beat on high until light and fluffy. You may need a bit more or less confectioner's sugar for the right consistency. It's easier to spread if you chill it a little. Heat the cream just to boiling. Remove from heat and add the chocolate. Stir until it is smooth and shiny. Use to cover the cake while the ganache is warm. Cut the cake horizontally into four, even layers. Place the first layer down on the waxed paper. Spread with 1/3 of the filling. Top with the next layer and push down slightly. Repeat until the last layer is on top. Gently push down to secure layers and refrigerate for at least an hour or two. Just before serving pour the warm ganache over the cake. Using a very long cake spatula move the cake from the waxed paper to a serving dish. Oh my gosh, this is seriously gorgeous. I love a great layer cake. I don’t often see marshmallow used in cakes and I don’t know why – it’s so light, fluffy, and delicious! I think it must be because it’s sometimes hard to work with. I bet this tastes way, way better than what your hubs spotted at the store! Wonderful combo of flavors! This is usually the same reaction when I say I can make it to my husband. He knows it will be months before it ever makes it to his mouth. Props to you for being a sweet wife and getting on top of making this beautiful cake! The buttercream sounds so good! I am the same way, lol! 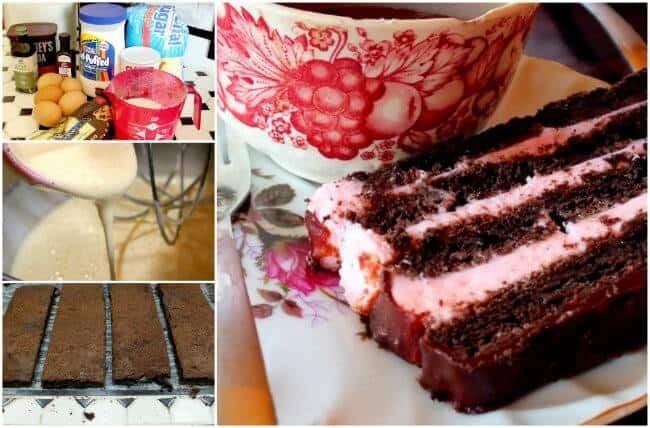 Every time my hubby goes grocery shopping he is drawn to the pre-made cakes…and every time I tell him they look great, but as far as tastes goes, they’re nothing compared to homemade! So sweet of you to make this one for your hubby! 🙂 They do always look pretty though! I love the look of a layer cake. I really like the flavors you used. Thanks Peter…I love the mint and chocolate combo!